Harvesting Sea Buckthorn berries is a hot, dusty, thorny job. Profile: Contrary to what its name suggests, Sea Buckthorn (a.k.a Seaberry) oil does not come from the sea. It’s actually derived from the fruit or seeds of the Sea Buckthorn shrub. The shrub itself is extremely hardy, growing in cold climates and has enormous, pointy thorns. Harvesting the delicate berries is a very labour-intensive job. The berries themselves are quite sour but have a lovely, zingy, tropical flavour. Used in Chinese medicine over 1000 years ago, Sea Buckthorn oil is rich in vitamins and minerals. The fruit contains an exceptional concentration of natural anti-aging Vitamin C, which is 12 times higher than that of an orange! Sea Buckthorn fruit is becoming as popular as pomegranate and acai berry because of its very impressive nutritional profile. It contains over 190 nutrients and phytonutrients, and high amounts of vitamins, minerals, fiber, and protein, making it a powerful Superfood. The unique high fatty acid content of Sea Buckthorn oil and the wealth of nutrients it contains make it one of the most health-promoting herbal oils today. When applied on the skin, Sea Buckthorn oil does not leave an oily residue as virtually all ingredients are properly absorbed and quickly assimilated into the skin. Topical application of Sea Buckthorn oil both has many benefits on skin problems. It promotes skin hydration, elasticity, cell regeneration, and even helps treat and prevent acne. Sea Buckthorn oil has anti-inflammatory properties that help reduce swelling and redness associated with many skin conditions, including eczema, psoriasis and rosacea. Origin: Ours comes from France, Siberia, Canada (supplier varies, depending on seasonal quality). Our Sea Buckthorn oil is not Certified Organic, however it is cold-pressed and unrefined. The farmer does not routinely spray the bushes. We have been advised that spraying only occurs if there is an outbreak that threatens the plant. In this rare case, the farmer is very careful not to spray the fruit. 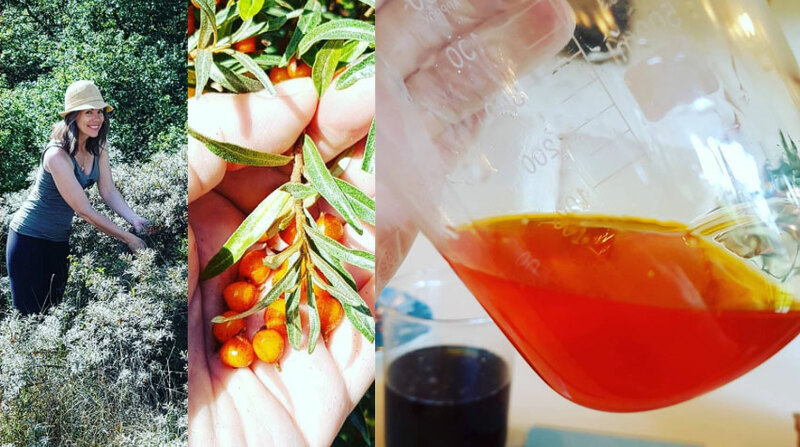 Rather than import C02 extracted Sea Buckthorn oil based on its organic merit, we choose to support ethical businesses first.